Super crunchy on the outside and light and fluffy inside, this falafel delivers a delicious flavour combination – fresh herbs, nuts with a wonderful spicy finish of ginger and chilli. Pour 1.5l litre of filtered water to a pot, add the chickpeas, pop the lid on and leave to soak for at least 10h (overnight works best). 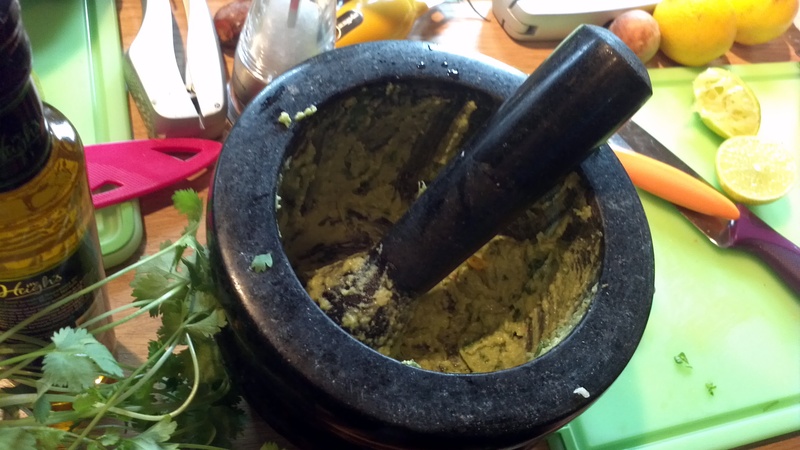 When you are ready to make your falafel, drain the chickpeas then pop them into a food processor. Add all other ingredients spreading them evenly around the processor bowl but leaving the pecans to be added last. They will help to weigh down the fresh herbs, which means that everything will better stay in place while mixing. Use the pulse function until your mixture is coarse to semi-coarse. Do not over pulse / mix or you will end up with a hummus-like texture, which isn’t ideal for falafels. Pop the blade back on your processor and pulse few more times. Or worst case scenario add some eggs to help it glue together, but you really shouldn’t need to do this, if you followed the measurements as stated. Once all your falafels have their final shape, it’s time to fry! In a heavy bottomed frying pan, ideally a small cast iron one, preheat 100ml of olive oil (or more if you pan is bigger, ideally you are aiming for enough oil in the pan to cover half of your falafel). Bring the oil up to 180C before popping your falafels in. Do not over crowd the pan. I cook 6 at the time despite having space for 12 or even 15. More falafels at one time popped into the pan means a bigger drop in the oil temperature once you put them in (this will result in your falafel soaking up the oil making them greasy) and a general inability to turn them with ease, so take it easy and fry them in batches. When done remove with a slotted spoon and place on some kitchen roll to soak up any residual oil. Serve warm or cold with a green salad or go classic and add into a wrap. Most importantly of all though… enjoy! What’s your favourite way of serving them? Halve and stone the avocados (saving a stone) and use a spoon or avocado tool to scoop out the flesh into the Mortar and pulverise with the Pestle. Scatter with rough cut coriander leaves. Adjust seasoning, lime juice and garlic to taste. Serve with crudités or tortilla chips and enjoy the fruits of your labour. The addition of fine cut onion and tomato add extra flavour and colour.